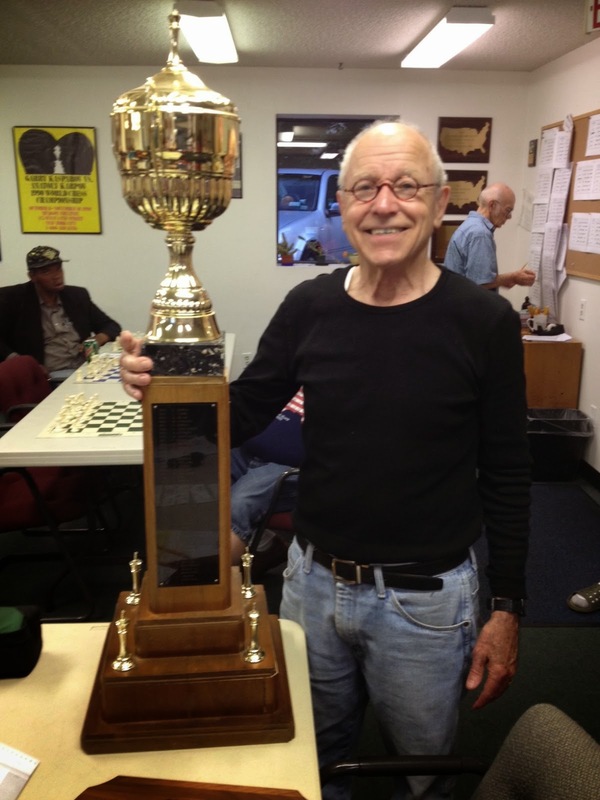 is the new Community Chess Club Champion! Games and Photos in the Results Section of this post. Call the Rochester Chess Center at 585-442-2430 for details. 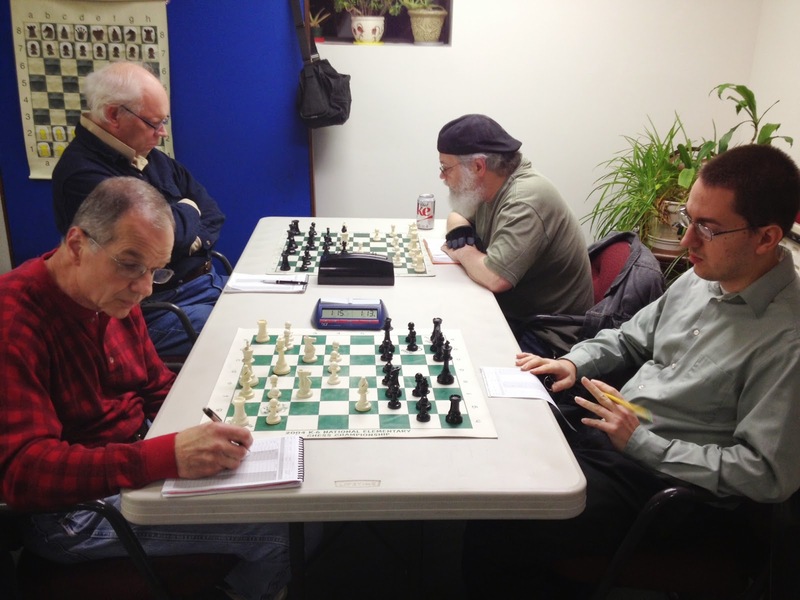 Mondays: Fall Chess League at the Rochester Chess Center - See schedule below. (G/90d5 for boards 2 and below. G/90+30 for board 1). First four Wednesdays in October: 18th Annual Club Championship at the Rochester Chess Center - See schedule below. Rated games also available for people not playing in the championship. 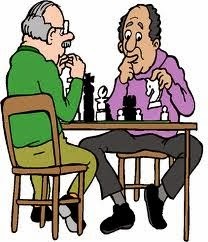 Chili Chess Club meets Thursday, Oct. 23 3:30-5:00 at the Chili Library - Organized by Adam DeSantis and Fred Mellender. Stop by to watch or play, 221 Norris Drive, Rochester, NY 14610. 585-442-2430. 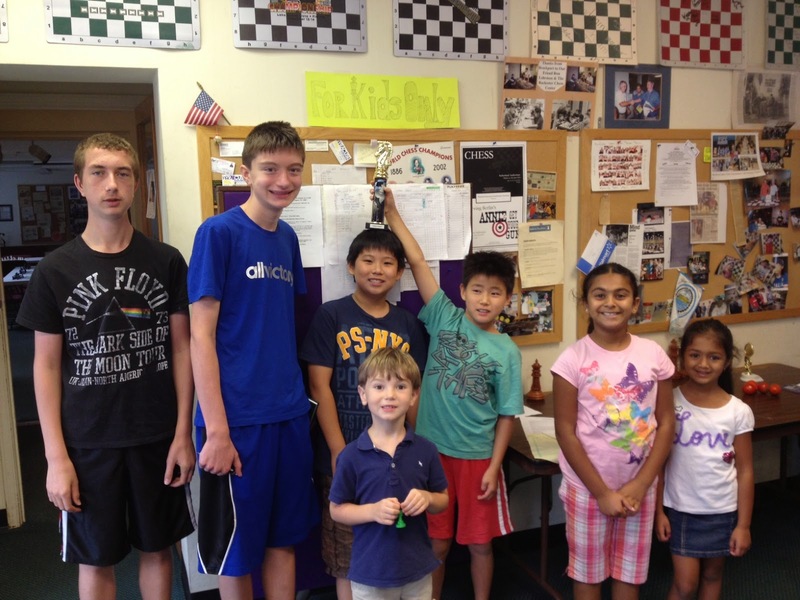 The 18 Annual Community Chess Club Championship will be held October 1, 8, 15 and 22 at the Rochester Chess Center. Save these dates! 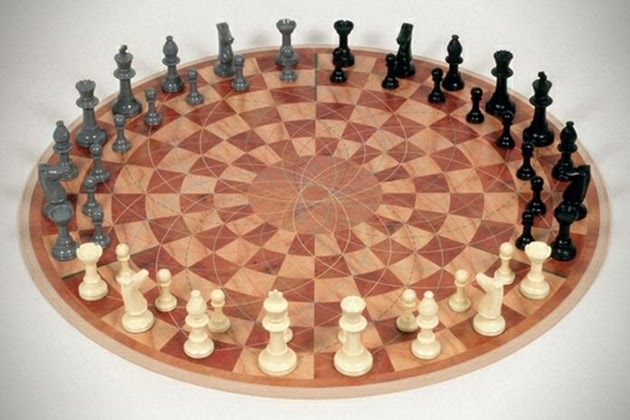 If you're not a member yet, we welcome you to join our excellent chess club! We will give out AWARDS and celebrate with cake on Nov. 5th! October 18-19: CENTRAL NEW YORK OPEN at SYRACUSE UNIVERSITY (free parking at college, Hall of Language, South Crouse Ave.) - Click here for Details! March 14th-15th: 37th Annual Marchand Open 2015 at the Strong Museum, Rochester, NY. 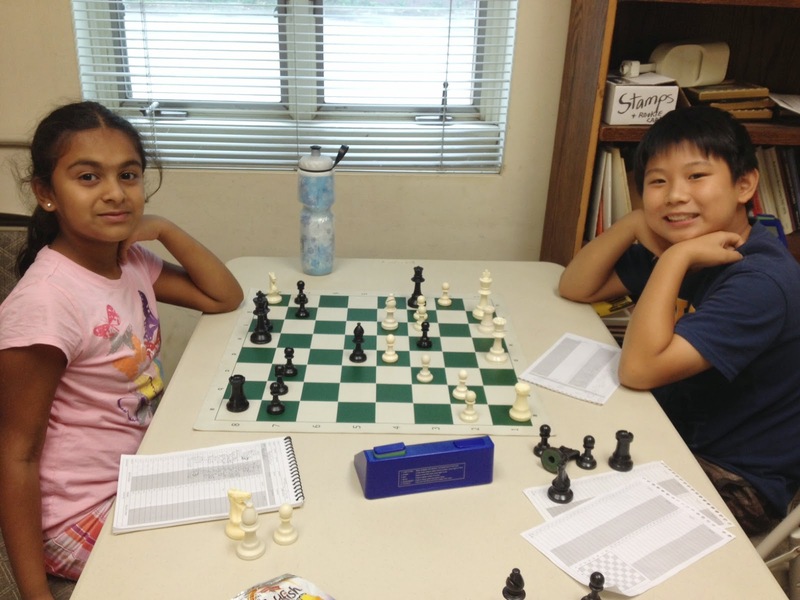 The Rochester Chess Center is looking for feedback for adding another day/night of chess play during the weekdays/weekend. Players can also suggest possible time controls. 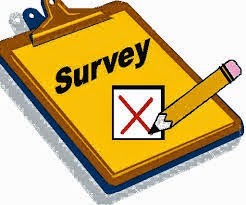 Surveys are at the chess center. For more information, contact Ron Lohrman at the Chess Center: 585-442-2430, or stop by in-person: 221 Norris Drive, Rochester, NY 14610.
in the movie "Sherlock Holmes: A Game of Shadows" (2011). 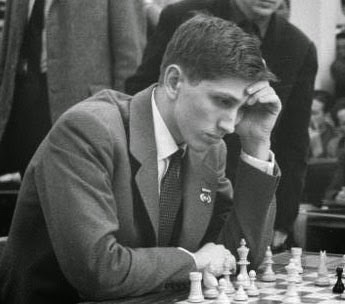 Chess Player Jim Trowbridge has a new Blog - Smoke The Pawn. Click here to leave this page and open Jim's blog pages. 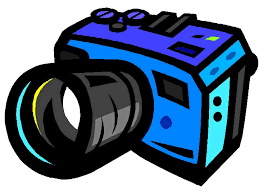 G/80d5: Click Here for game results. Background: Howard Decker (left) won his game with Guy Fuhrman. Front: Chuck Saweikis (left) drew his game with Blaze Veljovski. 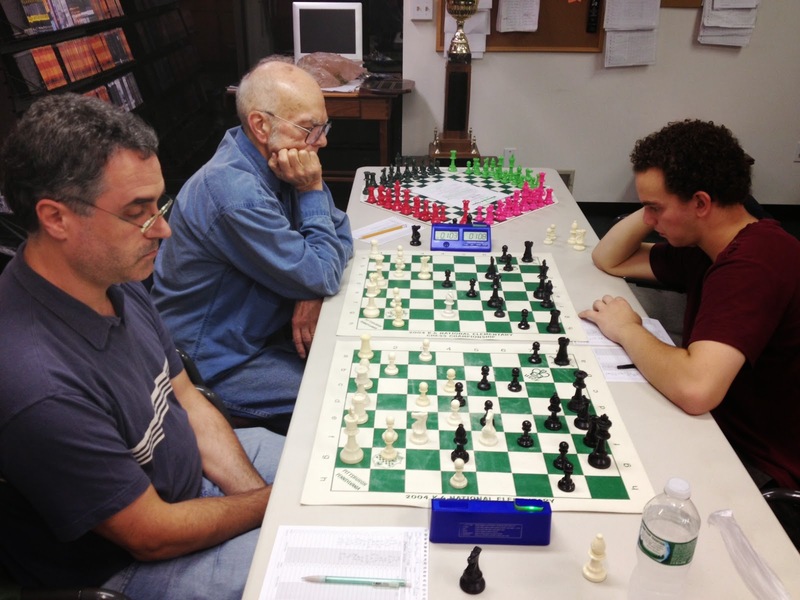 Abraham Glasser (right) played a simultaneous against Bob Talbot (background) and Howard Ebersman. 1st Place: Jason Niu (trophy winner) and Michael Niu with 3 points each. 2nd Place: Edward Hofmeister with 2 points. 3rd Place: Vladimir Bondar with 1.5 points. 4th Place: Maia Casamayor -Taylor and Sam Scarantino with 1 point each. News: Webster Kehoe becomes the new CHAMPION with a perfect score of 4 points! Webster Kehoe scored 4 points in the championship. More info, games and photos will be added throughout the day. Last night, we started the final round with only two players with 3 points: Abe Glasser and Webster Kehoe. However, there were also several players with 2.5 points which could have possibly entered a tie-break situation had Abe and Webster obtained a draw. But, that was not the case! In time pressure, Webster Kehoe took a winning position and converted it to his 4th point in the championship tournament! Webster Kehoe is the new club champion! Defending club champion Abe Glasser took 4th place in the championship. Click here for more photos from the 18th Annual CCCR Championship. October 18-19: The Central NY Open is taking place this weekend at Syracuse University. 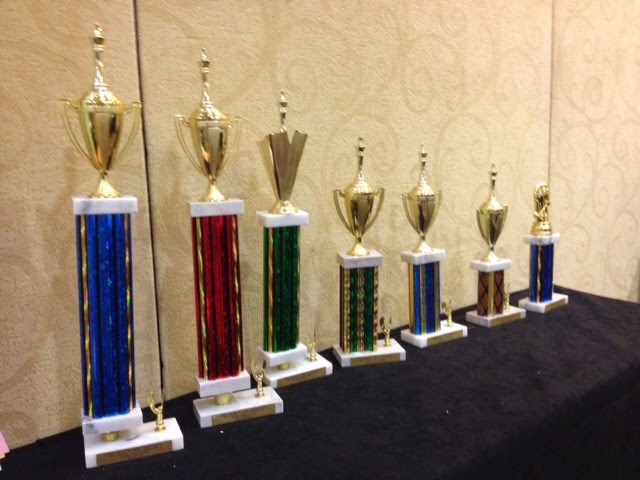 A large group of Rochester chess players are participating in this tournament. The Chess Center is providing transportation to and from the event. 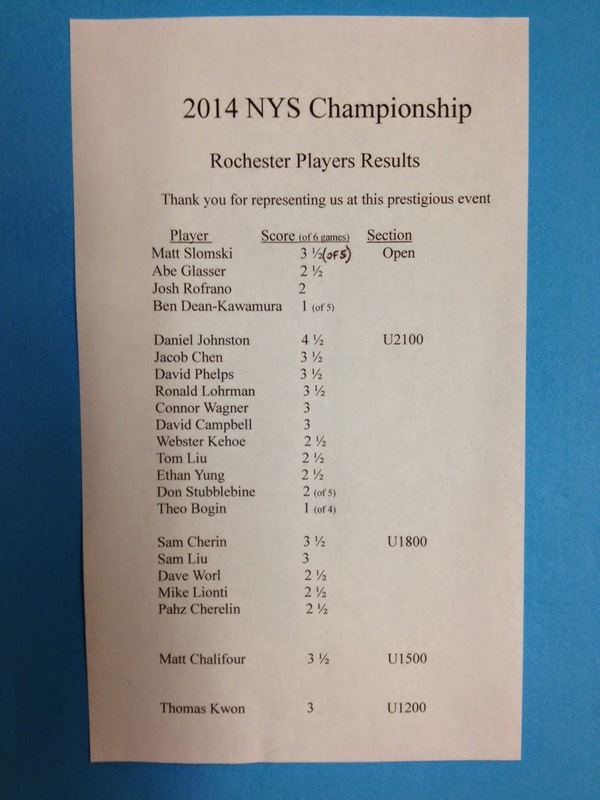 Open Section Results (local players): 1st Place Josh Rofrano 4 points!!! 2nd place David Phelps and Jacob Chen 3.5 points, Lev Paciorkowski 3 points, David Campbell 2 points, Daniel Johnston 1 point. U1900 Section Results (local players): 2nd Place Jamshed Ahmed 3 points, Pranav Senthil Kumar 1.5 points. U1500 Section Results (local players): Matt Eckert 3 points, Arjun Ganesh 2.5 points, Thomas Kwon 2 points. 1st Place: Andrew Guo (trophy winner) with 3 points. 2nd Place: Aidan Kharroubi, Arianna Kharroubi, Dale Janezic and Jason Niu with 2 points each. 3rd Place: Evan Peterson, Michael Niu and Revathi Meka with 1 point each. Andrew Guo was today's trophy winner! Andrew Guo (left) played Aidan Kharroubi. Dale Janezic (left front) played Michael Niu. John Manning (left) played Jim Attaya in the final round today. News: Defending Champion Abe Glasser and Webster Kehoe have 3 points, going into the FINAL round! Preliminary 4th round pairings are posted above. 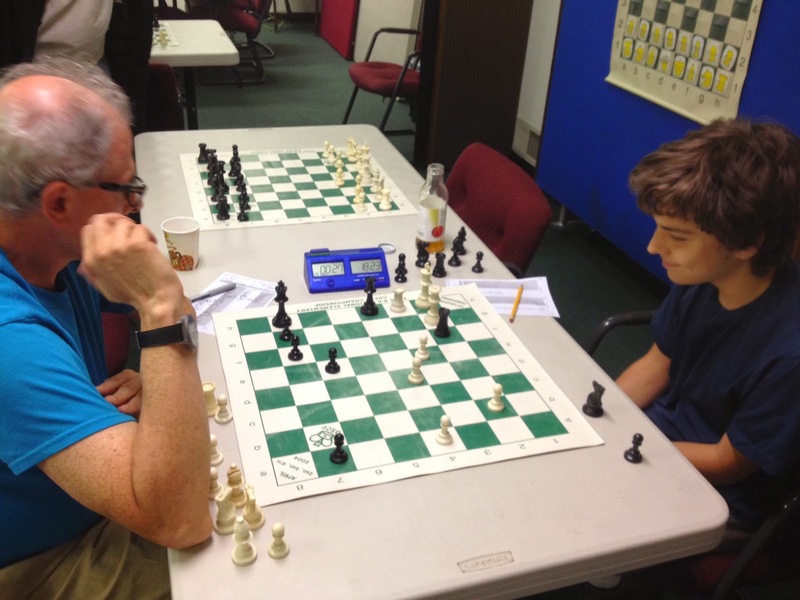 It was another fine evening of superb chess at the Rochester chess Center. 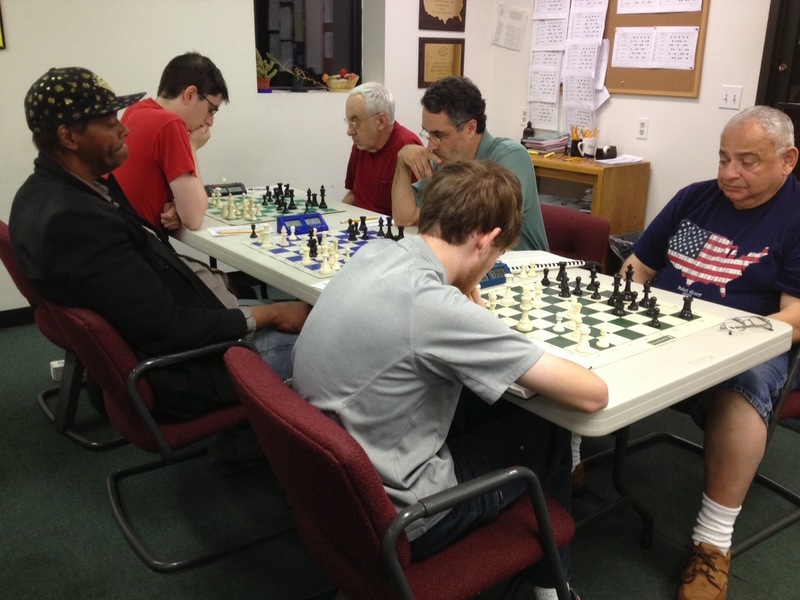 This week, we had another full house of players participating in the 18th Annual Community Chess Club of Rochester Championship. 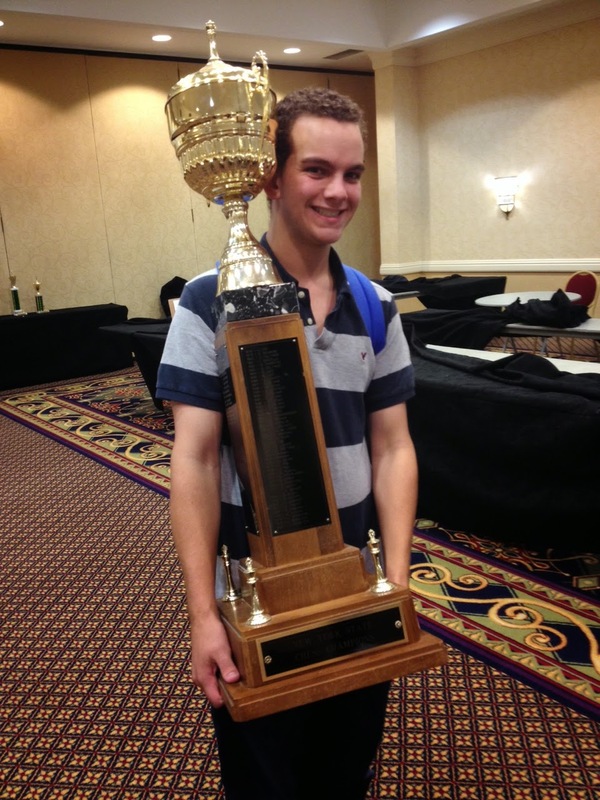 On the top boards, Abe Glasser continued to defend his title, and Wilson H.S. chess team player Webster Kehoe won his game. They are now the only two players with 3 points, entering the final round next Wednesday. We were happy to see many visitors to the club tonight, including David Hayes and Mike Kehoe, the coach for the Wilson H.S. team. Ron Lohrman (tournament director) and Mike Lionti (tournament organizer) have teamed up for all 18 events over these last 18 years. Every year, this tournament is the highlight of chess competition in the chess club. 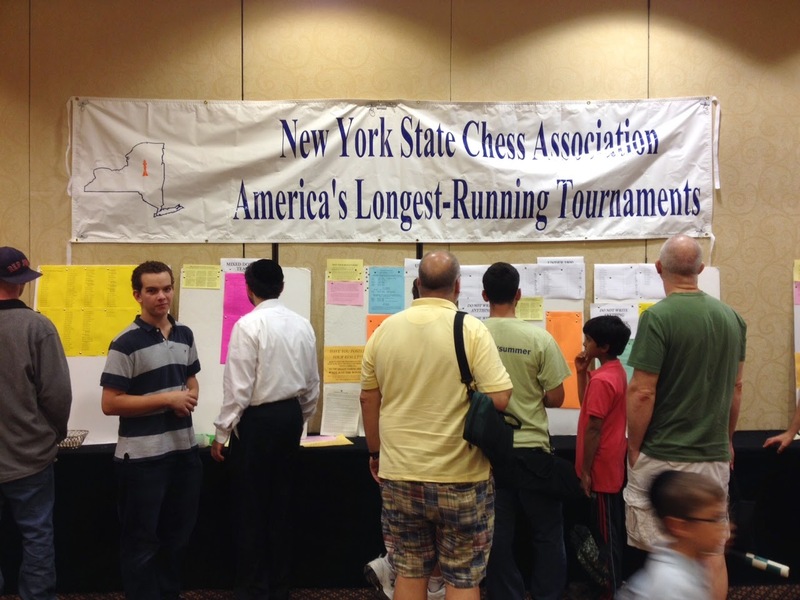 We are very happy with the excellent participation again this year, and we hope chess continues to grow in Rochester, NY. A cross-table of the event will be posted over the weekend, along with the final round preliminary pairings. Abe Glasser (right) won a very close game with David Campbell. With both players in time pressure, Webster Kehoe held on to win against David Phelps. Mike Connelly (left) won his game against Thomas Kwon. With a total of $1,000,000 in prizes, the Millionaire Chess Open is the highest-stakes open chess tournament in history. 1st Place: Arianna Kharroubi (trophy winner), Dale Janezic and Andrew Guo with 3 points each. 2nd Place: Aidan Kharroubi with 1 point. 3rd Place: Vlad Bondar and Revathi Meka. 1st Place: Franklin Jones (trophy winner) and Andrew Kinard with 3 points. 2nd Place: Dale Janezic and Graham Mosmann with 2 points each. 3rd Place: Gavin Ng and Revathi Mekia with 1.5 point each. 4th place: Lucas Ng and Vlad Bondar with .5 point each. Arjun Ganesh (left) gained valuable experience today playing FM Isay Golyak. We will give out AWARDS and celebrate with cake on Nov. 5th! 2nd Place: Michael Niu with 2 points. 3rd Place: Andrew Guo and Graham Mosmann with 1 point each. 34 players came for chess tonight! 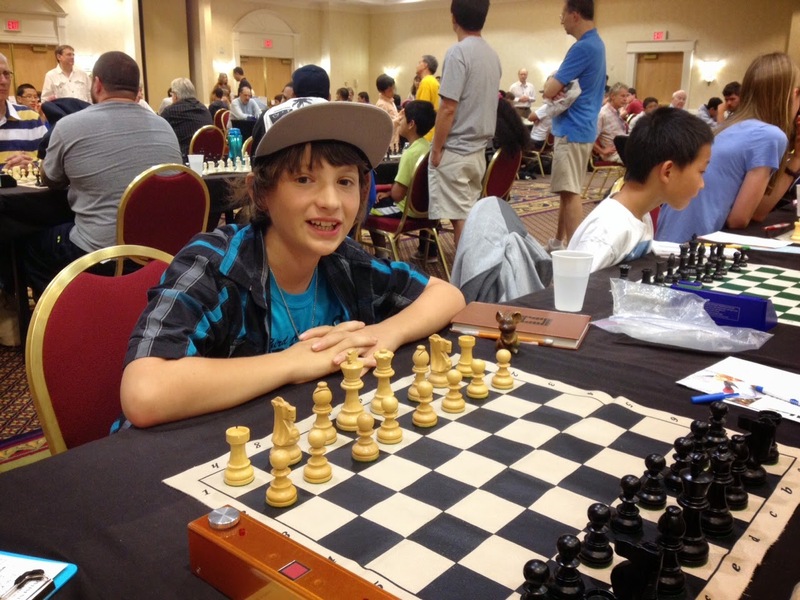 Click here for the chess results from this USCF-rated event! Dale Janezic won the trophy today! Sept. 20, 2014. FM Isay Golyak in round #1 vs. Rich Motroni. Sept. 20, 2014. Doug Spencer (left) drew with Ben Chernjavsky. Sept. 20, 12014. 1st Place: Arianna Kharroubi (trophy winner), Aidan Kharroubi, Thomas Kwon, and Jason Niu with 3 points each. with Daniel Johnston. Sept. 10, 2014. Don Stubblebine. Sept. 10, 2014. Pahz Cherelin gets ready for his next chess match. Abe Glasser stands with the Championship trophy. Revathi Meka played Andrew Guo. Sept. 6, 2014. Andrew Guo (with trophy held over his head) was today's trophy winner! 2nd Place: John Rutecki and Andrew Kinard with 2.5 points each. 3rd Place: Thomas Kwon and Graham Mosmann with 2 points each. 4th Place: Revathi Meka and Rihanshi Agrawal with 1 point each. Matthieu Chalifour (right) had a very nice game with Derek Linton. The USCF computed Matthieu's performance rating to be 2110 !!!! Sept. 6, 2014. David Worl stands with the NYS Championship trophy.